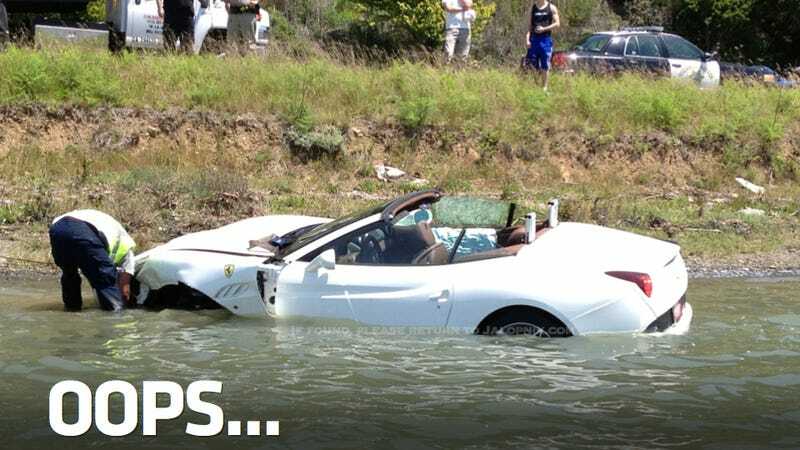 A man hoping to buy a $200,000 Ferrari California launched it into the bay just north of San Francisco during a too spirited test drive Saturday afternoon. The car reportedly went airborne before landing in the drink. At least it didn't catch on fire. Randall Wahlstrom was out waterskiing when he saw the Ferrari submerged in a few feet of water near the edge of Richardson Bay, just a few miles from Ferrari of San Francisco. Washtrom heard that the driver was a customer who was "just about to buy that car." This was confirmed by a tow truck operator on the scene who says the driver was apparently going "a bit too fast" and spun out before flying approximately 20 feet in the air and landing the water. The impact was strong enough to trigger one of the side curtain airbags in the California. Neither the driver nor the salesman in the seat next to him were injured. No word on whether or not the man plans to buy a different Ferrari now that this one's a little soggy. This is the second exotic to get destroyed on a test drive in California in the last month. A Lamborghini Aventador burned to the ground on a test drive in mid-April.